Some may not realize that, aside from viewing the plates, the Three Witnesses of the Book of Mormon beheld several other Nephite artifacts, including the “miraculous directors which were given to Lehi while in the wilderness, on the borders of the Red Sea” (Doctrine and Covenants 17:1). These “directors” apparently refer to the “spindles” which “pointed the way” that Lehi’s family should travel through the wilderness (1 Nephi 16:10). According to the prophet Alma, this was “the thing which our fathers call a ball, or director—or our fathers called it Liahona, which is, being interpreted, a compass; and the Lord prepared it” (Alma 37:38). Why was it important for the Three Witnesses to visually witness this object? One likely possibility is that it gave credence to the Lehite exodus story and the founding of the Nephite nation. Don Bradley has proposed that just as the Ark of the Covenant held sacred religious artifacts related to the founding of the Israelite nation, the Nephites had their own national treasures—including the Liahona—which they held in their own sacred repository. The Ark of the Covenant was known to contain a golden pot of manna, the rod of Aaron which budded, and the stone tablets from Mt. Sinai (Hebrews 9:4). Remarkably, the liahona parallels to each of these items. The strongest resemblance is between the Liahona and the manna. Both were discovered in the morning, both were discovered upon the ground, both were round in appearance, and both evoked wonder or astonishment. It is also significant that both items helped wandering travelers to avoid starvation in the wilderness. The manna itself was food, while the Liahona helped Lehi’s family get food by directing them to fertile areas and wild game (1 Nephi 16:16, 30–31). It’s even likely that Nephi intentionally crafted his story in a way that would help readers make a connection between the manna and the Liahona. In each situation, the miraculous obtaining of food came immediately after members of the group murmured against the Lord. And in each case, the murmuring was related to hunger and the desire to return back to their respective lands. In the Bible, we learn that Aaron’s rod, among other staffs, was used as an appropriate means of determining God’s will (Numbers 17:1–11). The Liahona’s “spindles” or “directors” seemed to similarly function as a means by which the Lord could communicate with His people. In both circumstances, the objects were rod-like in shape and had writing upon them. Using sticks or arrows for divination practices was well known in many ancient societies, and God manifested his will in this manner in a number of Bible stories. Finally, just as the Lord permanently inscribed the Ten Commandments onto the stone tablets with His own finger (Deuteronomy 9:10), He also caused writing to miraculously appear upon the Liahona’s “pointers” (1 Nephi 16:26–29). Even though the words found on the Liahona changed from “time to time” (v. 29), it’s clear that both objects conveyed the specific words of the Lord. Alma, when giving counsel to his son Helaman, declared that “it is as easy to give heed to the word of Christ, which will point to you a straight course to eternal bliss, as it was for our fathers to give heed to this compass, which would point unto them a straight course to the promised land” (Alma 37:44). Don Bradley has noted that the “Jerusalem temple was, in one sense, a house for the Ark of the Covenant.” With this in mind, he asked, “How could the Nephites keep the Law of Moses without access to the Ark of the Covenant? … Something, presumably something remarkable, would have to sit in the Ark’s place” in their own temple. It is not certain exactly where the Nephite relics were housed or how they were understood by their people. But the correlations between their treasured artifacts and those housed in the Israelite Ark of the Covenant are intriguing. 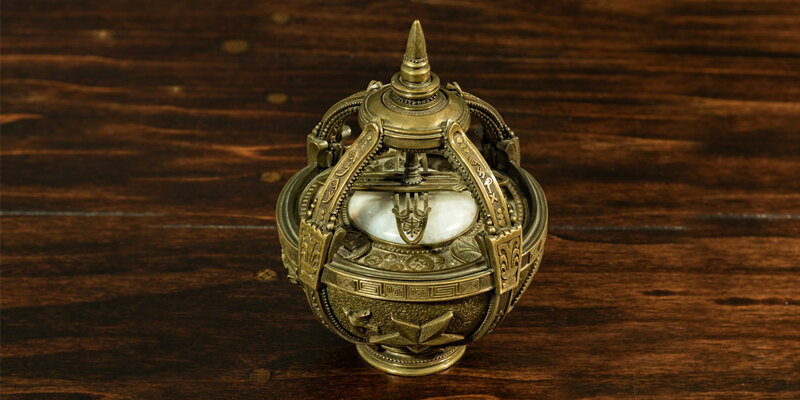 Recognizing that the Liahona has parallels to each of the sacred items in the Israelite Ark helps explain why it was included among the sacred objects shown to the Three Witnesses. This divine artifact was revered among Nephite prophets and was kept and preserved as one of their most sacred national treasures. Its very existence helps establish the reality of the Lehite exodus from Jerusalem. And it meaningfully represents the Lord’s hand in leading a branch of Israel to a land of promise in the New World. In explaining the reason for presenting the Nephite artifacts to the witnesses, the Lord declared, “And this you shall do that … I may bring about my righteous purposes unto the children of men in this work” (Doctrine and Covenants 17:4). The Liahona, in particular, has become a treasured symbol in our own gospel dispensation. It has been adopted as the name of one of the official LDS church magazines. And numerous conference talks have drawn from its symbolic lessons about giving heed to divine revelation. More than ever before, the historical reality and spiritual power of this divinely crafted object is helping strengthen testimonies and further the Lord’s work and purposes. Don Bradley, “Piercing the Veil: Temple Worship in the Lost 116 Pages,” FairMormon presentation, 2012, online at fairmormon.org. Robert E. Wells, “The Liahona Triad” in A Book of Mormon Treasury: Gospel Insights from General Authorities and Religious Educators (Salt Lake City and Provo, UT: Deseret Book and Religious Studies Center, Brigham Young University, 2003), 80–96. Hugh Nibley, “The Liahona’s Cousins,” Improvement Era, February 1961, 87–89, 104–110. David Whitmer reported on several occasions that the Three Witnesses beheld this object with the other Nephite artifacts, just as was promised in Doctrine and Covenants 17:1–2. See History, circa June 1839–circa 1841 [Draft 2], p. 25, footnote 79, accessed December 1, 2017, online at josephsmithpapers.org. For discussions of how the Liahona may have functioned, see Robert L. Bunker, “The Design of the Liahona and the Purpose of the Second Spindle,” Journal of Book of Mormon Studies 3, no. 2 (1994): 1–11; Robert F. Smith, “Lodestone and the Liahona,” in Reexploring the Book of Mormon: A Decade of New Research, ed. John W. Welch (Provo, UT: FARMS, 1992), 44–46; Alan Miner, The Liahona: Miracles by Small Means (Springville, UT: Cedar Fort, Inc., 2013). For encyclopedic treatments of the Liahona, see Douglas Kent Ludlow, “Liahona,” Encyclopedia of Mormonism, 4 vols., ed. Daniel H. Ludlow (New York, NY: Macmillan, 1992), 2:829–830; Neal Elwood Lambert, “Liahona,” in Book of Mormon Reference Companion, ed. Dennis L. Largey (Provo, UT: Deseret Book, 2003), 519–520. Etymological Explanation,” Journal of Book of Mormon Studies 16, no. 2 (2007): 60–67, 97–98. See Don Bradley, “Piercing the Veil: Temple Worship in the Lost 116 Pages,” FairMormon presentation, 2012, online at fairmormon.org. See also, Gordon C. Thomasson, “Mosiah: The Complex Symbolism and Symbolic Complex of Kingship in the Book of Mormon,” Journal of Book of Mormon Studies 2, no. 1 (1993): 28–32. It’s unclear exactly how this verse should be reconciled with 1 Kings 8:9, which declares that nothing was in the Ark except for the stone tablets. It’s possible that by Solomon’s time, Aaron’s rod and the jar of manna had been removed. It’s also possible that the rod and the manna were never strictly in the Ark, but were placed somewhere close by. There may even have been opposing traditions about what was contained in the Ark. In any case, other scriptures make it clear that the rod and the manna were definitely associated with the stone tablets and their resting place inside the holy of holies (Exodus 16:33–34; Numbers 17:10). See Bradley, “Piercing the Veil,” online at fairmormon.org. For a discussion of murmuring and the Liahona, see Hugh W. Nibley, “The Liahona and Murmurings in the Wilderness,” in Teachings of the Book of Mormon, 4 vols. (Provo, Utah: FARMS, 1993), 1:208–224. See Exodus 16:3, 11–15; 1 Nephi 16:18–20, 35, 39. See also, Alan Goff, “Mourning, Consolation, and Repentance at Nahom,” in Rediscovering the Book of Mormon: Insights You May Have Missed Before, ed. John L. Sorenson and Melvin J. Thorne (Salt Lake City and Provo, UT: Deseret Book and FARMS, 1991), 92–99. See Numbers 17:2–3; 1 Nephi 16:29. See Hugh Nibley, “The Liahona’s Cousins,” Improvement Era, February 1961, 87–89, 104–110; Hugh Nibley, “The Arrow, the Hunter, and the State,” in The Ancient State, The Collected Works of Hugh Nibley, Volume 10 (Salt Lake City and Provo, UT: Deseret Book and FARMS, 1991), 1–32. For a different treatment of divination practices in the Bible and the Book of Mormon, see Amanda Colleen Brown, “Out of the Dust: An Examination of Necromancy as a Literary Construct in the Book of Mormon,” Studia Antiqua 14, no. 2 (2016): 27–37. Emphasis added. See also, W. Rolfe Kerr, “The Words of Christ—Our Spiritual Liahona,” Ensign, May 2004, online at lds.org. For correlations between the sword of Laban, Urim and Thummim, breastplate, and the plates themselves, see Bradley, “Piercing the Veil,” online at fairmormon.org. In both ancient and modern times, witnesses have been used to help establish the truth of important facts in legal proceedings. Israelite law, for example, establishes the need for two or three witnesses in trial situations (Deuteronomy 19:15). For more on the need for witnesses, see John W. Welch, “Doubled, Sealed, Witnessed Documents: From the Ancient World to the Book of Mormon,” in Mormons, Scripture, and the Ancient World: Studies in Honor of John L. Sorenson, ed. Davis Bitton (Provo, UT: FARMS, 1998), 391–444. For instance, see Mosiah 1:16; Alma 37:38–46. One helpful resource for identifying how the Liahona has been discussed in general conference talks is the LDS Scripture Citation Index found at scriptures.byu.edu. See also, Robert E. Wells, “The Liahona Triad” in A Book of Mormon Treasury: Gospel Insights from General Authorities and Religious Educators (Salt Lake City and Provo, UT: Deseret Book and Religious Studies Center, Brigham Young University, 2003), 80–96.